Sending big files and large attachments through email is part and parcel of modern life where emails are extremely essential. In fact, thanks to advancement of technology, the file size has been kept increasing especially for audio, video, music and other media files and documents. Most email services today now able to host and keep several gigabytes (GB) of emails. However, the maximum size of emails, including attachments, that are allowed to be sent or received is mostly much lower, such as 10 MB or even much lower. The most generous email attachment size limit is Gmail at 25 MB, and some other paid email service providers such as Office 365 and Google Apps. However, even 25 MB is meager is today’s standard, and often not sufficient due to email size and attachment size restriction limit. There are many file sending, file transfer or file hosting services that emerged to fill the gap by offering a way for user to upload the big files to a cloud location, and then send the link to recipients to download and retrieve the files from the cloud location. However, the alternative is cumbersome, troublesome, not secure, not suitable for sensitive files, not reliable, and not as easy as just adding attachments. Gmail now allows users to send files, documents, videos, photos, music and more of up to 10 GB in size as attachment through integration with Google Drive, a popular file storage service by Google too. With seamless integration, sending big files through email in Gmail is almost as simple as attaching them. Users can set permissions for all files uploaded and sent via Google Drive to ensure that only intended recipients can access and download the shared files. Login to Gmail. Compose or reply to email that you want to send big files. Click on the Insert files using Drive icon (i.e. Google Drive icon) at the bottom besides the “Send” button. 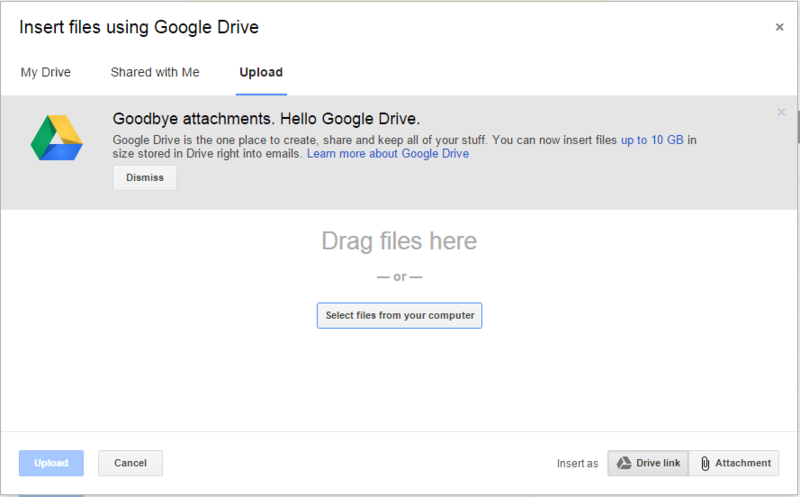 In the pop-up “Insert files using Google Drive” page, select which method of attachments you prefer at the bottom right corner: Drive link (link to open the file in Google Drive) or Attachment (Embed file in email itself). Note that file exceeding 25 MB can only be attached as link to Google Drive. If the files have already been uploaded to Google Drive, or the files are shared with you, select (check) them from My Drive or Shared with Me tabs. You can select and send multiple files in one email by holding Ctrl or Shift (for range selection) when selecting. Then, hit Insert to add the attachments or links to the email. If the files are on your local computer (not yet uploaded), go to Upload tab. Drag the files to the page or click on Select files from your computer. You can select and send multiple files in one email by holding Ctrl or Shift (for range selection) when selecting. After choosing the files, hit Upload to start uploading and add the attachments or links to the email. Can view – Anyone with the link can view but not edit or comment. Can comment – Anyone with the link can view and comment but not edit. Can edit – Anyone with the link can view, edit and comment. For more restrictive permissions (such as with email recipients only instead of everyone), click on More options, and select Recipients of this email. Complete the step with how you would like the files are shared based on permissions listed above. 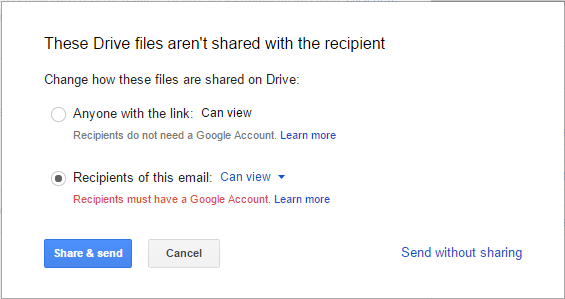 Note that this option required email recipients to have Google account before able to open the files. Click Share & send to send the email. You can also send the email without setting the proper permissions by clicking on Send without sharing. But you will need to manually edit the permissions later, otherwise recipients won’t be able to open the files.